abstract Jenkins and other Continuous Integration systems can trigger Sahi scripts as part of the build process using Sahi's ANT target. Automation is useless without Continuous Integration. Sahi suites should be periodically executed and CI systems can trigger suites when code changes happen. Sahi suites can be triggered via ANT. We configure Jenkins to call Sahi's ANT target and then make Sahi's logs accessible from Jenkins. Sahi Pro needs real browsers to playback test scenarios. But most Jenkins/build machines run in server mode and do not have a GUI. This forces end users to either try with headless browsers or to execute Sahi scripts remotely. Jenkins machine (J): Run Jenkins on server. No Sahi installed. Sahi slave machines (SL1, SL2, SL3): These are slave machines with Sahi Pro Runner (or Sahi Pro) running on them. 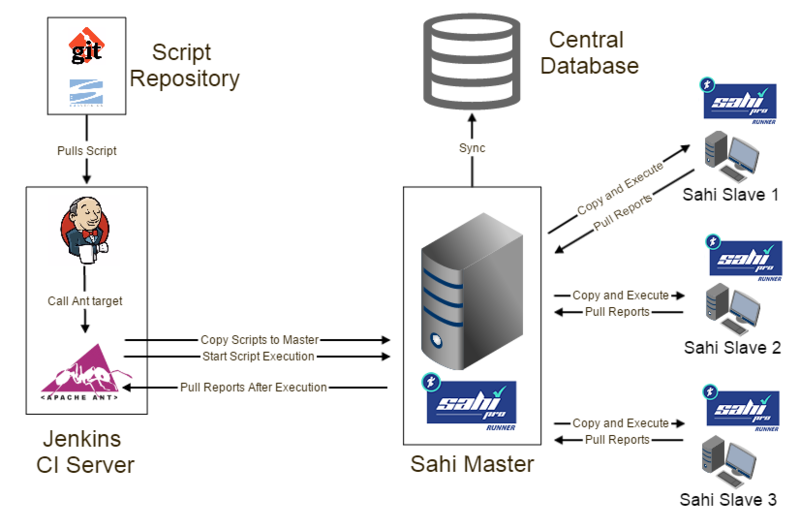 Central Database: Sync all the logs from Sahi Master to this machine. For more info, look at Sahi Sync DB. Jenkins pulls the latest scripts from the Source Control Management (SCM) system. It calls the Sahi ant target. Sahi target copies over the scripts from Jenkins (J) to master (SM). SM then copies scripts to SL1, SL2, SL3, distributes the execution and collects all reports. Sahi ant target then pulls reports from SM to Jenkins. This allows Jenkins to remain a headless server and does not need Sahi installed on it. Also all distribution of scripts and pulling of reports happens through Sahi's ant target itself. Before integration, you will first need an ant target to run the suite file. You can create the ANT target from the editor using playback options. Save the file in any path accessible by Jenkins (say C:\jenkins_sahi) and lets call it build.xml. 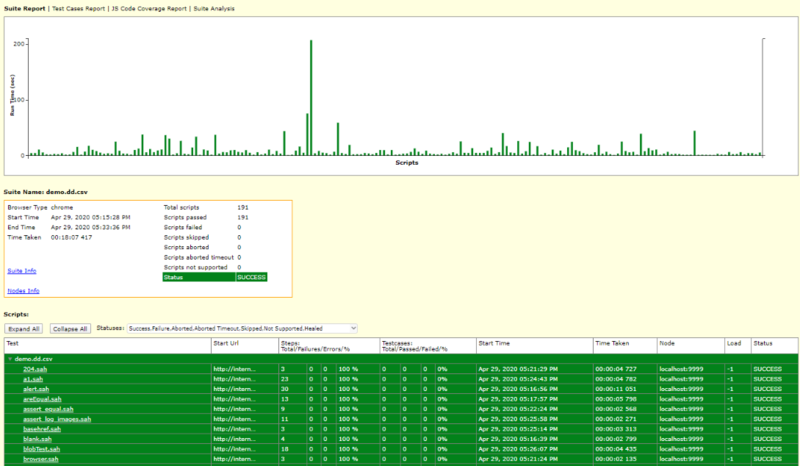 Also Install the HTML Publisher plugin if you wish to see HTML logs via Jenkins UI. infoNote: If you are using Jenkins 1.625.3 or above, and if you are not able to view HTML Reports correctly, please read Content Security Policy here As these versions of Jenkins has introduced Content-Security-Policy to protect Jenkins users from malicious HTML/JS files in workspaces, /userContent, or archived artifacts. From the Jenkins dashboard, click on New job (or New item). Select Build a free-style software project. Click OK. Type -f C:/jenkins_sahi/build.xml in the ANT target textbox. 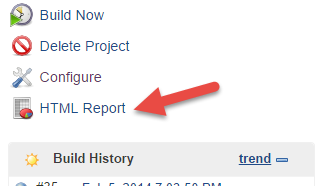 To publish HTML reports after build, click on Add Post Build Action button and select Publish HTML Reports. Provide Logs directory and other details. Please note, in the field of "HTML directory to archive" you need to provide the same path defined in the report attribute of Sahi task in build.xml. e.g. <report type="html" logdir="C:/jenkins_sahi/logs/"/>. This is configured via the Offline Reports in the Editor Playback Properties UI. On the Jenkins dashboard, click Build now. If you are using parallel or single session or distributed run with same master, make sure Sahi Pro Runner is installed and running on the Jenkins machine and on relevant slaves. info Note: You need to have HTML Publisher plugin installed. Make sure you have configured HTML Reports as described in the section above.